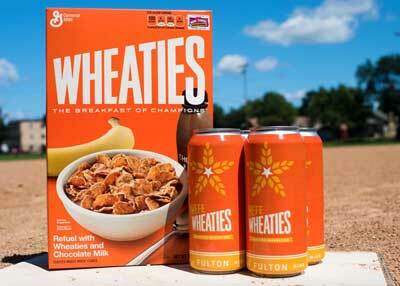 Wheaties beer: breakfast of champions or stupid marketing stunt? Multinational food company General Mills has partnered up with Minneapolis craft brewery Fulton to create a Wheaties-branded Hefeweizen beer, appropriately called HefeWheaties. However, before you get too excited at the thought of beer as a suitable breakfast drink, realise that this beer will not actually contain Wheaties or feature the cereal in any way during the beer brewing process. Instead, according to General Mills, the beer will be brewed with water, malted barley, malted wheat, a yeast strain specifically developed for fermenting American-style wheat beers, as well as hops from Germany, Australia and the US. It seems the only direct connection between beer and cereal in this instance will be the branding – as well as the fact that Fulton and General Mills are both based in Minneapolis, and Fulton Brewery founder Ryan Petz formerly worked at General Mills. HefeWheaties will go on sale in Minnesota from 26 August 2015, where it’ll be available at the Twin Cities market in 16-ounce tallboy cans, and in four-can packs at limited retailers in the area. The beer will also feature on tap at the Fulton Brewery taproom in Minneapolis. Most disappointing for fans of Wheaties and craft beer, HefeWheaties will not be available for shipment or purchase outside of Minnesota.